Navigation bar: [intro] [puzzler] [explore] [discuss] [digress] [t'snext] [resources] [credits] "Go back" to return. Put on your Sherlock Holmes hat and practice deciphering the whispers of nature provided by this model of a rotating ring with adjustable-radius. It's designed to give visitors a feel for (to even let them take data on) what happens as they change the radius of the spinning ring from its maximum allowed value (around 45 earth radii) to its minimum allowed value (the size of a good-sized virus molecule containing tens of thousands of atoms). It is also designed to be used by intro-physics teachers wanting to briefly extend the class discussion of circular motion toward its large size-scale (relativistic) and/or small size-scale (quantum-mechanical) limits. An incidental bonus is that it might give visitors a sense of changing physics on different size-scales as well. Why are there limits to the hoop's radius? The reason is that we're investigating rings rotating within a range of easily observable rates, namely angular frequencies around a radian per second and hence rotation frequencies around 1/2π ∼ 0.16 cycles per second (Hertz). Solid objects much larger than 45 earth radii can't rotate this many cycles per second because the required kinetic-energy, momentum, and proper-velocity (map-distance traveled per unit rim-time) all go infinite as the rim's coordinate-velocity approaches lightspeed (a foot per nanosecond). This in spite of the fact that, to observers from a distance, the hoop doesn't seem to be rotating very fast at all! On the other hand, solid objects much smaller than a virus can't rotate freely at less than a cycle per second, because angular momentum is quantized in units of Planck's constant over 2π. This could be a big problem for nanoscale ballet dancers, and for example is one reason that some gases require very little heat to make their temperature go way up. Before we examine the limits, let's first consider loop-rotation at any speed. When you put your mouse over the figure below, the red lines and/or arrows pointing radially outward denote the local direction of the artifical gravity (and "fake" centrifugal force) that accelerated organisms riding on the ring might measure with a spring balance, and invoke to explain what happens e.g. when they try to jump "up" toward the center of the ring. From the map-frame perspective shown here, of the rotating ring's center of mass, of course objects riding the ring are being accelerated inward towards its center (centripetally) as they follow the circular path. Rather than going up and coming back down, for example, objects thrown "up" toward the ring's center simply follow a straight line path that eventually runs them into the ring further around the circle. The concept of artificial gravity nonetheless remains useful for organisms living on the ring, and is an example of a kind of geometric (or "affine-connection") force that Einstein's equivalence principle for general relativity has shown to be useful from all kinds of accelerated perspectives. All such locally-useful geometric forces have two important features in common. First, they seem to act on every ounce of an object's being, e.g. like the apparent force when driving around a curve that pushes you toward the outside, and like the gravity on earth that keeps you from floating off into space. Secondly, there exists a locally-inertial frame of reference from whose perspective this force doesn't exist at all. In the case of the ring below, and for the case of the car taking a curve, one such locally-inertial frame is that of the stationary observer who is in fixed position with respect to the curved path. In the case of gravitation on earth, freefall frames (e.g. orbit and rain frames*) are locally inertial. * cf. Edwin F. Taylor and John Archibald Wheeler, Exploring Black Holes (Addison-Wesley Longman, 2004). Slide your mouse cursor over the image below, and the ring should begin rotating with red lines and/or arrows denoting the direction of the "artificial-gravity". These vectors (originating from points on the ring) are equal in size and opposite in direction to the radially-inward centripetal acceleration that each part of the ring experiences on its path around the center. Instructions for changing your vantage pont and adjusting the ring radius may be found below. After playing with these a bit, try to adjust the radius for the loop until the artificial gravity is "one gee", i.e. 9.8 meters per second squared. Is this size reasonable? Any thoughts on how it might allow you to design an interesting amusement park ride? Would a large hoop with "one gee" of artificial gravity (e.g. the size of a space station, an L5 space colony, a covenant halo, or Larry Niven's ringworld) require rotation frequencies smaller, or larger, than 0.16 Hertz? Operation Summary: You can rotate your viewpoint by dragging the mouse over the image. You can zoom in and/or out on the ring, by SHIFT-dragging the mouse down and/or up, respectively. You can pause/restart the simulation by double-clicking on the image. When paused, squares over the resizing points allow you to "mouse drag" the ring radius to almost any size you like between upper and lower limits. The top row of buttons report data on: (i) the viewpoint vector, (ii) field width, and (iii) changes in viewpoint. 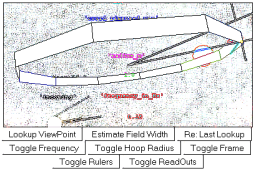 The middle row of buttons toggle: (a) hoop rotation frequencies between 0.16, 0.32 and 0.08 Hertz, (b) hoop radius between 1, 108, and 10-7 meters, and (c) observer frame between non-rotating and "rotating with the hoop". The bottom row of buttons toggle various aspects of the simulator heads-up display. Hanging out nearby you may also notice a 22-inch diameter sputnik clone (the antenna angle is a bit smaller), and a blue-green planet about the size of planet earth.